Navigating the IVD development path doesn’t have to be complex — it just requires a partner who has the expertise, experience and resources that knows the way. 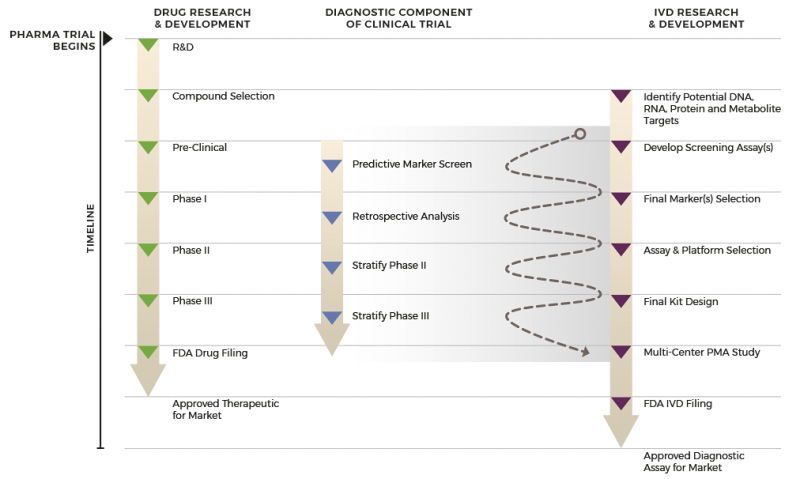 As a Contract Diagnostics Organization (CDO), ResearchDx is a unique, integrated business entity that solves logistical complexities associated with multi-partner outsourcing for companion diagnostic development. Unlike traditional development strategies where specialized expertise must be coordinated through multiple organizations, a CDO provides all expertise and services within a single, integrated organization. By integrating and synchronizing all IVD and pharmaceutical development activities, a single ‘start-to-finish’ partner simplifies and speeds the process to complete your FDA-approved companion diagnostic at the right time. Unlike multi-partner outsourcing, your dedicated project manager at ResearchDx serves as your point person to guide you through all phases of your project. As an integrated organization, we have built-in flexibility to adapt to your project’s changing needs and priorities with the efficiency of a single-point contact. We have gathered scientific and medical expertise in all areas of diagnostics to ensure projects are designed, implemented and stay on target with all priorities and schedules. Our operation is supported by a fully accredited and licensed clinical laboratory to support all research and assay development, clinical and esoteric testing activities. As an independent laboratory, we are able to evaluate and validate technologies best-suited for your companion diagnostic without bias to any instrument or technology manufacturer. Supporting broad development capabilities on a wide array of platforms, we stay current with the newest advances in genomic platforms and technologies. Working closely together, we will assist in choosing the best commercial strategy for your diagnostics assay. Note: We are free of relationships with instrumentation manufacturers or the sale or promotion of instrumentation. ResearchDx meets and maintains compliance per applicable Quality System (QS 21 CFR 820) requirements and specifications for the Food and Drug Administration (FDA) — regulated medical devices (cGMP). All assays developed at ResearchDx undergo rigorous analytical and clinical validation exceeding specific regulatory guidelines set forth by Clinical Laboratory Improvement Act (CLIA), College of American Pathologists (CAP) as well as FDA. Additionally, all projects undergo an independent quality review process to ensure all design specifications have been met. Schedule a consultation to learn more about Companion Dx services.